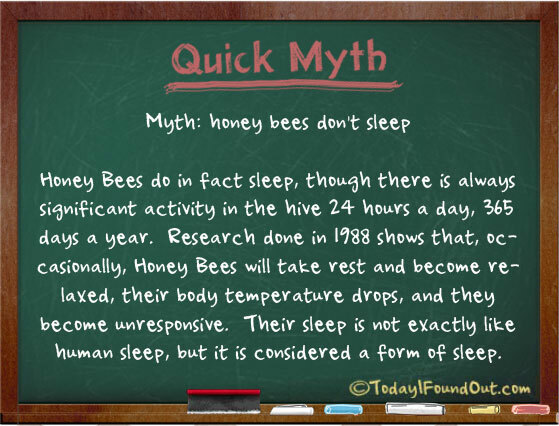 Myth: Honey Bees Don’t Sleep. Honey Bees do in fact sleep, though there is always significant activity in the hive 24 hours a day, 365 days a year. Research done in 1988 shows that, occasionally, Honey Bees will take rest and become relaxed, their body temperature drops, and they become unresponsive. Their sleep is not exactly like human sleep, but it is considered a form of sleep. Saw a honey bee “sleep” or something. There was a small opening in the rear end of a hand-held power washer, a place in the end of the cap that screws in where the hose goes. So, it’s kind of an end cap with a small “cave” on the protruding end – a little short tunnel. And, the bee flies up and puts its upper body half into this hole (“cave”) with the lower half hanging outside. I’m wondering what the heck, it’s not a flower, it’s not wet, and about the only thing it can do for this bee is provide a dark safe space – kinda like an ostrich sticking its head in the sand to hide. Must have been a “cat nap for the bee. Anyway, it was almost sunset and I’m sure the bee had a long day and probably needed a rest before heading back to the hive. Really cool!